At about the same time as William the Conqueror was thinking that Hastings would be a good place to visit, a seed from a baobab tree germinated and so began its long and distinguished career as a tree. That tree still stands. It is a mighty tree and one that is no doubt much photographed by visitors to The Selous Game Reserve in Southern Tanzania. 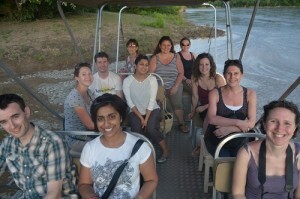 Greetings from very green Selous Game Reserve. Leaving the swaying palm trees of Zanzibar behind I boarded a tiny plane heading out to the vast expanse that is The Selous in Tanzania. Now I am a dreamer but really there was not a person or a vehicle for as far as the eye can see – I am sure that we were the only ones out there! Jumbe is a ranger in the Selous who takes guests from Serena Luxury Camp and Mivumo River Lodge to photograph the reserve’s wildlife. But Jumbe has his own camera and he has been sending us some of his pictures to share with you.